“Let’s meet for breakfast.” This is one of those sentences I miss the most about Bangalore. We all know of the awesome pub culture the place has but the beautiful people of Bangalore love their breakfast even more and rightly so. With varieties ranging from the good old Masala Dosa and Idli to Paya Soup, Bangalore offers you a plethora of choices for breakfast. While it’s impossible for me to list down all of them, here are a few based on my own personal choice as well as a few of my friend’s choices. Koshy’s still has a very old world charm about it and is also one of the more famous eateries in Bangalore. Rumour has it that even noted personalities like Queen Elizabeth II & Jawaharlal Nehru have dined here once upon a time. Well, if it’s good enough for the queen, I guess it’s worth giving a shot now isn’t it?! Koshy’s was a personal favorite when I was living in Bangalore. Breakfast there included poached eggs on Toast with a side of fried bacon and juice. Other must try items on the menu is the mutton omelettte and Mutton on toast. The place has not only survived since 1940 but has adherently become a part of the Bangalore culture. The early bird gets the worm and the same applies to anybody looking to eat what is probably the world’s best Idli and Dosa. MTR opens as early as 6.30 am and if you don’t reach there early enough you may just have to wait an hour or more to finally get a table. There is nothing peaceful about the place, it is definitely not for a lazy prolonged breakfast but the food! The food more than makes up for the chaos. Established in 1924, which makes it the oldest Idli/Dosa place in Bangalore, MTR has been serving comfort food for decades now without compromising on the quality. 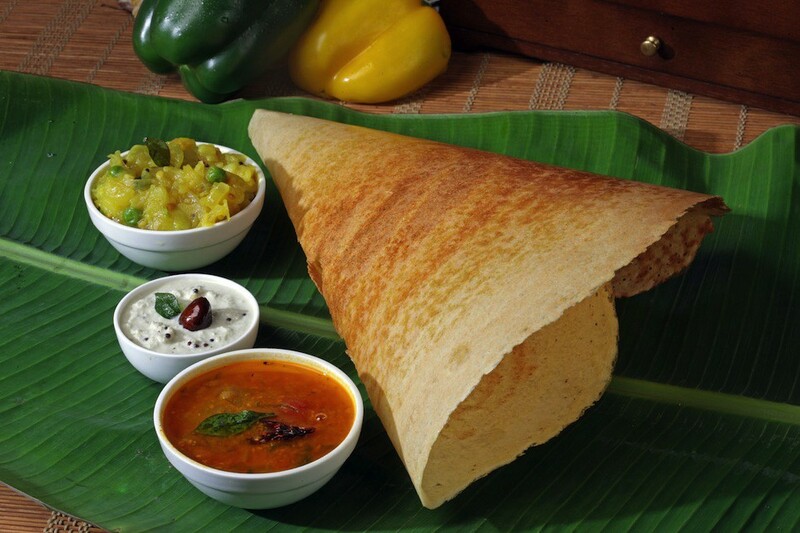 Must try on the menu are the Rava Idlis and Masala Dosa with a cup of Coffee. Nothing fuels you up for the day like a great breakfast and Hole In The Wall delivers just that. Tucked away on a street in Koramangala, this no frills place is more than what meets the eye. 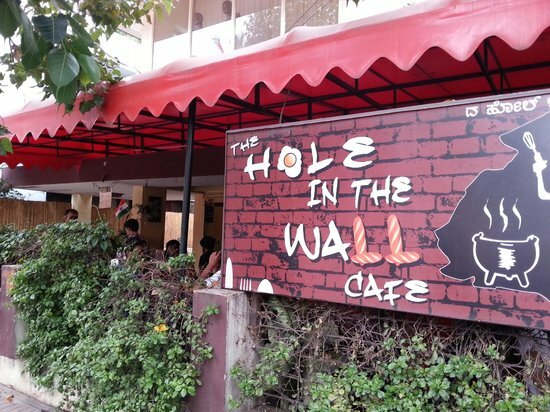 Don’t be surprised if you see a long queue waiting outside because Hole In The Wall is known for its extensive breakfast menu. You should try The All American Breakfast, The Farmer’s Basket and The Hangover Remedy. Their pancakes and waffles are brilliant as well. Probably not for the ones looking to do a conventional breakfast. Kannadiga cuisine is often mistaken to be primarily vegetarian but there is a whole lesser known yet delicious non vegetarian side to it and the best place to have it is at the famous Military Hotels in the city. One such place is Ranganna Military Hotel which is known to serve the best Leg Soup aka Paya in the city. If you are looking for something less adventurous then the Ragi Mudde with Chicken masala is your best bet. Vegetarians can get the usual idli and dosa, though this place is known primarily for the leg soup. What if I told you that a restaurant has been serving only 4 items for 46 years, would you believe me? Probably not, but Brahmin’s Coffee Bar has been offering a humble fare of just Idli, Vade, Khara Bhath and Kesari Bhath for decades. Couple your order with coffee or tea and you are good to go. Ridiculously cheap and extremely delicious, no wonder Brahmin’s is still brimming with customers even today. Location: Ranga Rao road, near Shankar Math, Shankarapuram, Basavanagudi area. Good post! I read your blog often and you always post excellent content.